With its newly accessible onshore and offshore mineral wealth sought by companies spanning the globe, mining developments remain a controversial topic in Greenland. At the heart of the debate is whether the boom will benefit or exploit the job-hungry local population. NUUK, Greenland — Although Greenland bears many signs of its European ties, its economy lags behind its Nordic counterparts. Unemployment sits just below 10 percent, and hardscrabble villages line its coasts, offering few job opportunities to residents. Much of the populace has been captivated by the economic promise of proposed mining projects ever since Greenland gained autonomy over its mineral resource policy from Denmark in a 2009 referendum. Meanwhile, multinational corporations have kept an appraising eye on the region as resources ranging from iron and zinc to uranium and rare earth elements become accessible. In recent years, the imminent expansion of mining and drilling in Greenland has been a divisive, hot-button issue in elections held throughout the self-governing Danish territory. Although prices for various minerals have slumped lately, the debate continues to simmer as numerous Greenland mining projects continue to move forward, representing new hope for an economy that largely relies on support from the Danish government and precarious fisheries. The extent to which Greenland welcomes or resists foreign mining interests could have tremendous implications, not only on its natural environment and small, coastal communities, but also on its aspirations of independence. “There’s a huge discussion about how to not depend on [payment from Denmark] and income from fish,” said Julie Rademacher, a former member of Danish parliament and currently an adviser with a Greenlandic labor union that represents 10,000 workers, equivalent to nearly 20 percent of the population. Rademacher upholds that mining is an essential step toward fiscal and political independence. But for that to happen, mining projects first need to garner broader support from local residents. That has not come easy, especially amid safety concerns about the uranium found alongside rare earth elements at the proposed Kvanefjeld mine near Narsaq, in southern Greenland. The project, operated by Greenland Minerals and Energy, would derive most of its profit from the site’s collection of rare earth elements, but it could also become the second-largest uranium mine in the world. In 2013, Greenland lifted a quarter-century ban on uranium mining by a single vote in Parliament. The Nalunaq Gold Mine is Greenland’s first gold mine. At Kvanefjeld and beyond, officials insist there are strict environmental safeguards in place, and that Greenland has sought to model its policies after countries known for rigid standards, such as Canada and Nordic countries. While most mining companies active in the region are headquartered overseas, they are required by law to create Greenlandic subsidiaries. That way, disputes and regulatory issues fall under Greenlandic and Danish jurisdictions. Mines also need to have a bond in place to cover cleanup costs if they go bankrupt. Despite assurances from officials that adequate protections are in place, some environmentalists express skepticism about Greenlandic regulations meeting the highest international standards. “We have seen progress, but we’re very far from getting there,” Burgwald said, noting that there have been significant improvements in the last five years. He said Greenpeace opposes the open-pit uranium mine and offshore oil drilling, but otherwise evaluates mines on a case-by-case basis, recognizing their economic potential. Regulation can be complicated by the fact that, in many ways, Greenland’s young government is learning how to manage the unfolding minerals rush as they go. “It’s developing all the time. Now that we have uranium as a byproduct, they need to develop regulation for that,” said Hans Jensen, a logistics manager for Greenland Minerals and Energy, who feels that regulations are toughening with time. Regulatory officials confirmed that their codes are still evolving as diverse mining interests pop up. “We didn’t have anything about radioactive metals before, and so we had to develop that along the road,” said Josephine Nymand, head of the Department of Environment and Minerals at the Greenland Institute of Natural Resources. She says the department’s development of radioactive expertise is an ongoing process. Perhaps even larger questions center on the social impact of proposed mines and whether the jobs created will primarily benefit Greenlanders or foreigners. 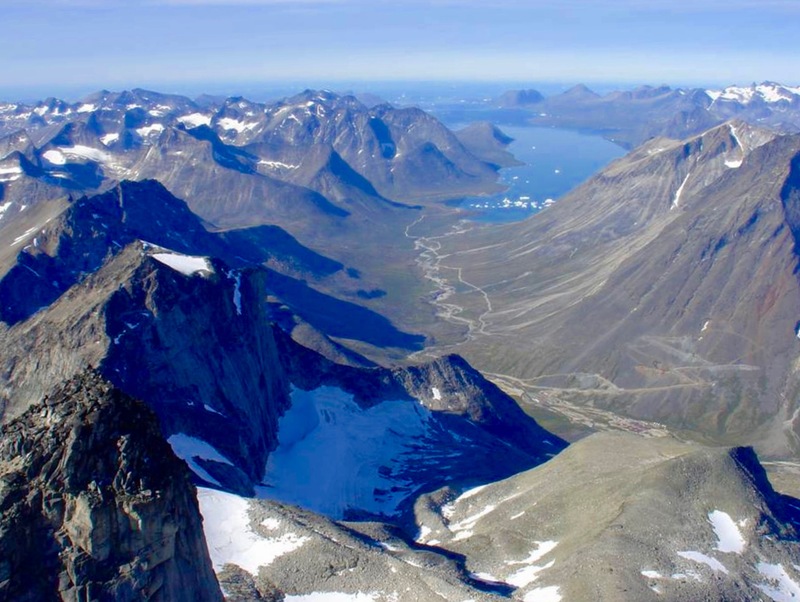 Before a project goes into production, companies must sign an Impact and Benefit Agreement (IBA) with the Greenlandic government and the municipality of the mining site in question. This arrangement determines how much of the workforce should be sourced locally. Mining proponents like Rademacher insist the IBAs are sufficient, but others aren’t so sure. The matter is complicated by the relatively small pool of qualified laborers in Greenland, and some say that the IBAs do not go far enough in protecting the job prospects of Greenlanders in the face of foreign competition. There is also concern that Greenlanders’ employment prospects are undercut by certain laws. The so-called “large scale act” includes provisions that allow companies with mining projects exceeding 5 billion Danish kroner (about $744 million) to hire foreign workers at lower salaries, Jensen said. For reference, the Kvanefjeld project has a budget capped at $1.6 billion, and a proposed iron mine north of Nuuk — now stalled due to financial struggles of the parent company — carried an estimated price tag of $2.35 billion to be developed. At Kvanefjeld, Jensen admits it will be a challenge to find qualified, local labor in both the construction phase and the more technical operation of the mine. “We might be in trouble getting the labor locally, even [across] Greenland,” Jensen said. Even with high unemployment in neighboring communities, some worry that technical mining jobs may not employ locals. Ejgil Gravesen, a high school teacher in the nearby town of Qaqortoq, fears that Greenlanders will be left with “taxi jobs” and other supporting activities. “There’s really a problem with the education level,” he said. The government has said that it acknowledges the training deficit and initiated an advisory program for businesses aiming to become subcontractors involved with mining companies. It has also contributed some funding to an engineering and “Arctic technology” university program in Sisimiut. Some officials downplay the level of controversy caused by mining proposals, contending that the debate is disproportionately fueled by a vocal minority within the country. “Because the government was split with one vote, it’s not the same as saying the country is split,” said Johannes Kyed, a corporate social responsibility manager for Greenland Minerals and Energy and a native of the Narsaq area. Citing job opportunities, tax revenue for local municipalities, and the development of infrastructure, Kyed touts the economic lift that Kvanefjeld will bring to the area. “Our project is kind of the catalyzer for this,” said Kyed. Despite the recent furor, some Greenlanders are tempering their expectations for a mining boom amid weak mineral prices and tedious application processes. But the world’s appetite for mineral resources, combined with Greenland’s push for economic development, figures to win out in the end. According to the Greenlandic government’s oil and mineral strategy released in 2014, if numerous projects go forward, tax revenues of 30 billion Danish kroner (more than $4.4 billion U.S.) could be generated in 15 years. The report states, “Some of these revenues will go towards financing the expected phase-out of the block grant from Denmark,” while much of the remainder would go to a long-term welfare fund. “At the end of the day, most Greenlanders just want a job,” said Soren Pedersen, an official in the government’s Ministry of Mineral Resources. “They would like to see some activity and some job creation.” And in Greenland, resource-dependent activities like mining are one of the only options on the table. “They’re not necessarily pro-mining, they’re pro-development, and mining is one of the areas where there’s great potential,” Pedersen adds. Even concerned parties figure that mining is inevitable. “The question is whether it happens 5, 10, 20 years from now,” said Burgwald. He hopes that the projects will be carried out responsibly and in a way that maximizes benefits to Greenlanders. But whether the time lag will be sufficient to revamp environmental safeguards and put job-training programs into place remains an open question. “You can’t have a mine without some benefits. But it’s a cost-benefit analysis,” said Burgwald. Proponents of mining say they, too, are mindful of the tradeoffs at play.